Is SpamRaptor the Best Email Spam Filter for Business? Of Course it is! Well, don’t take our word for it, just ask the thousands of happy customers who are spam free each day. SpamRaptor is the best business spam filter on the market today! 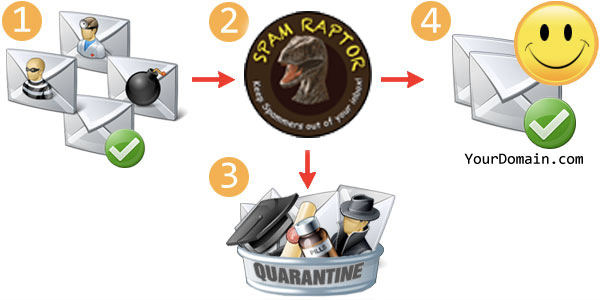 Signup for a FREE TRIAL of the BEST BUSINESS SPAM FILTER – SpamRaptor with any of our plans. Step 3: Let SpamRaptor learn your email patterns over a few weeks. It will auto detect your valid emails and start to block spam within the first week. SpamRaptor stops spam before it reaches your inbox. Blocks malware and viruses. Hosted spam filtering email solutions reduce the load on your server and resources. If you want to find out where your domain is registered, please go here: https://www.whois.net/. Follow SpamRaptor on Twitter or Facebook! Interested in Website Design, Web Development, App Development or Search Engine Optimization? Contact afterdarkgrafx.com today! Since 1992 we have provided solutions for business large and small. Contact us today for a FREE QUOTE!